Google marks the beginning of the 47th annual Special Olympics World Games with a animated Doodle. 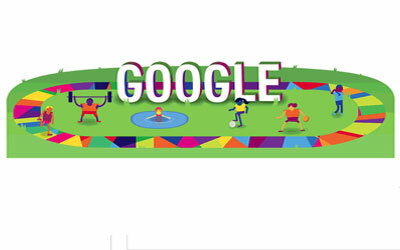 July | 25, 2015 :: Google marks the beginning of the 47th annual Special Olympics World Games with a animated Doodle. 7,000 world-class athletes from 177 countries will compete in 25 events in a celebration of athleticism, teamwork and inclusion. A reminder of the universality of sport, this is an opportunity for athletes with disability to compete in one of humankind’s greatest traditions. The games were created in Chicago by Eunice Shriver to give athletes with cognitive disabilities “the chance to play, the chance to compete and the chance to grow.” Like all World Games, the events over the next 9 days will challenge participants to push their bodies to the best of their capacity. They’ll compete against odds and against one another to perform at their peak and to honor their unique gifts to the fullest. Ranchi, Jharkhand | April | 24, 2017 :: T. V. Narendran [ MD, Tata Steel ] met Droupadi Murmu [ Governor Jharkhand ] at Raj Bhawan in Ranchi on Monday. Lions Club of Ranchi Youth Charter presentation Ceremony. The 2015 Special Olympics World Summer Games : Los Angeles :: July 25 to August 2, 2015.